Over at Marie's: Surprise! We're Expecting! Yup - you read that right! We're expecting baby number three in March! So, pretty much since Eliza was born I knew I wasn't done having kids, well, I knew I didn't want to be done having kids. Jon on the otherhand, well, he was done. There were many nights that I'd cry myself to sleep yearning for just one more sweet bundle to snuggle and love. Jon would often say, "We have two, healthy kids." I wholeheartedly agreed. I wanted a baby so bad that I seemed to mourn the baby that never was. Perhaps it was due to a blighted ovum which had occurred the winter before Henry was conceived. In many ways I felt robbed. There was a pregnancy, but it was over with before it even began. Without that happening though, I wouldn't have either of the kids I have now. The thought of the unknown has become more heartbreaking to me as the years have gone by - and let me tell you - every single September I think of my baby that was supposed to be. My first pregnancy. I mourned the baby that I never had the same way about the baby that was never conceived. I also remember hearing somewhere that if you look around your dining room table and you feel like everyone is there, then you're done. I NEVER once felt that way. To lighten the mood and a little TMI - Jon and I were NOT trying...until he started to see some close friends of ours with their three kids and my sister and her family of five. He began to think, "Eh, it's not so bad." So, we tried without trying. Fast forward to the Tuesday after the Fourth of July. I took the kids grocery shopping. We loaded up on groceries and while there I grabbed a pregnancy test. It was normal for me to buy a test every month. I was always crossing my fingers that an "Oops" would happen. It never did. I studied those lines. I held the tests up to the lights, up to the window. I used my phone flashlight to examine the test. Always so desperate. Nothing. I was thrilled when friends and family members had babies of their own, but I'd be lying if I said that I didn't go home and cry...and cry and cry and cry. It was pitiful. Truly pitiful. Jon was home for lunch and the kids were excited to see him. Once I had a second, I disappeared to the bathroom and took the test. The lines. Before they even fully appeared I could tell. I knew. There was color. I started to shake. My eyes filled with tears. I paced back and forth in our bathroom and into our bedroom. Utter disbelief. Hands down, it was one of the best moments of my life. It was strikingly similar to finding out about Eliza's conception. In that moment Henry was just fifteen months old and I just remember pure jubilation! He was my buddy in that happy moment. Two moments, I hope to always remember. Now if only I could remember finding out about Henry. Haha...I'll say though, those two years of it being just Henry and me were some of the happiest days of my life and those were the days that I found my purpose in this world; Motherhood. There's nowhere I'd rather be. I decided not to tell Jon at lunch, mostly because the kids would hear the news and I really wanted that moment to be between just the two of us. So I waited and waited and waited and waited. Those hours from lunch to bedtime felt like an eternity; a happy eternity. Of course I knew I couldn't wait any longer than that evening, but I knew I wanted to do something cute. Once Jon was out of work, I mentioned that I had to run to the store. I headed to the closest grocery store and grabbed a package of buns, some plates and a cute picnic tablecloth. Once home I snuck (sneaked?) everything inside the house and waited until the kids were in bed to place the bun on a piece of tablecloth and I then placed it in the oven. Later that evening I asked Jon to grab me a yogurt (something I would normally eat after dinner). I paused and told him it was in the oven. He knew... and I could feel that he knew what I knew. Haha! We had our first appointment on August 24th. I was 11 weeks. It was confirmed. There was a baby growing inside of me! It was also confirmed that I had reached "advanced maternal age." Sick. Sick. Sick. Sick. Sick. So much of the second half of my summer was spent indoors. There were so many days that I wanted to explain to the kids why Mama wasn't feeling well and why I was always on the couch. It broke my heart, but I knew it'd pass. I was sick all day, almost every day. It was NOT fun, BUT knowing why I was sick and knowing I was going to eventually feel those baby kicks this one last time made it all worth it. We finally told the kids about their new little baby brother or sister with a funny little onesie that said, Plot Twist. It took them quite a while to put it all together. Jon and I were trying to get them to figure it out for themselves, but Jon finally had to tell them that Mama had a baby in her belly. Don't mind the crazy eyes, the mismatched pajamas, the uncovered couch and the sitting on the table. Real life here, folks. The moment was better than a perfect setting. We put the onesie in multiple bags and containers so each kid could have a turn opening a box or bag. When they opened the onesie Henry put in on his head. Eliza thought it was hilarious! You can tell they were both asking, "Really?" Aaaaaand they were off... Haha! Both kids had apparently went into Henry's room to celebrate. LOL! Henry and his face. Omg. Haha! Eliza had so many questions and concerns. "Mama, where are we going to hang the baby clothes? We need baby diapers, baby toys, baby clothes... When can we go shopping?" We told the kids to keep it a secret for a while. I knew I wouldn't be upset if they actually did tell someone, but it was fun to watch them keep our family secret to themselves as best they could. Yeah, for Eliza that lasted until the first Monday back at school after the weekend. LOL! Girlfriend had told her friend, Ashlyn. Henry on the otherhand? He would've grown into old age with this secret. He didn't tell a soul. Haha! Eliza hugs my belly every day. You guys, it's the sweetest thing ever. There was a hot second or two at the beginning of the pregnancy when I would become super sad over thinking that perhaps this baby would take away from my time...our time...with the other two. I'd also get sad about there being a six and eight year age gap between Eliza and Henry and this baby. But once we started to tell friends and family and the more I read up on the subject, the more I heard only positively stream from those whom had been in similar situations. It was comforting to hear and it eased my mind and grew my heart that much more. Now, at this very moment, I wouldn't have it any other way. My nurse visit was on was September 21st. The heart beat was 160. I don't remember tearing up as much over hearing the heartbeat with Henry and Eliza. Maybe I was naive. Maybe I hadn't really understood this motherhood thing. But I do now and that itty bitty swooshing heartbeat is one of the best sounds in the world! 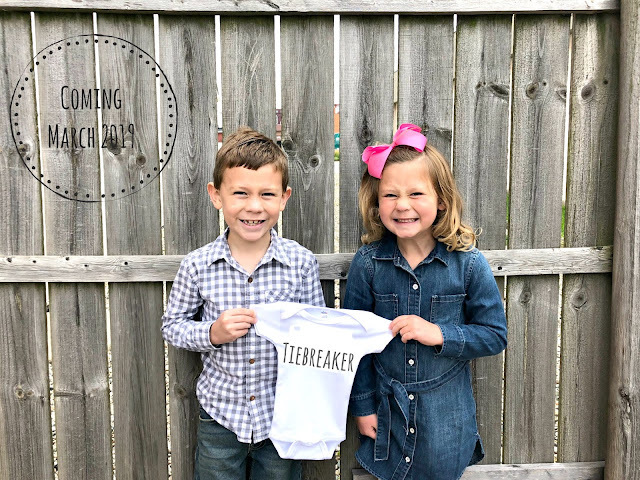 Our little "tiebreaker" is due March 17th, 2019.